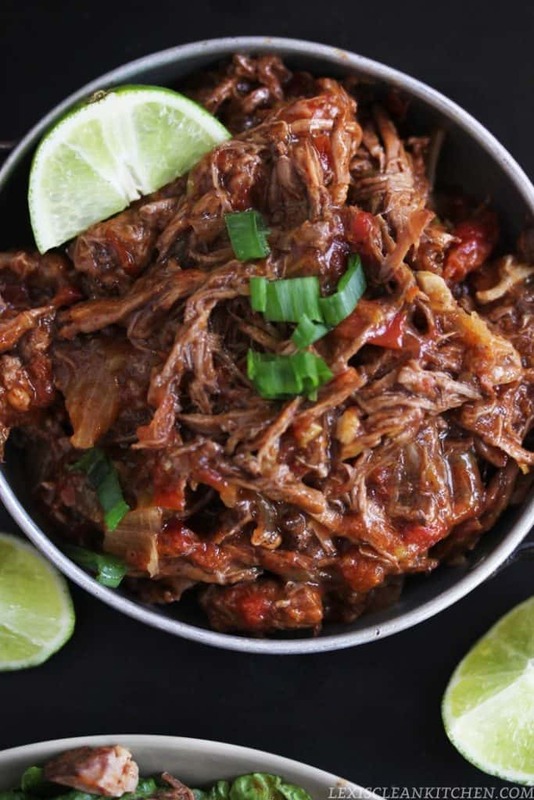 This Beef Barbacoa (Slow Cooker or Instant Pot) is so flavorful and slow cooked to perfection made either in the slow cooker or the Instant Pot pressure cooker! It is a great recipe for leftovers, too! If you follow me on Instagram, you’ve seen that we’ve had this beef barbacoa three times in the past three weeks. As breakfast bowls, as salads, as breakfast skillets, and as lettuce wrap tacos. It is just the perfect topping or filling for anything. Perfectly seasoned meat + only a little prep work = my kind of recipe! The tomato sauce also compliments the meat so well! In a bowl combine rub ingredients. Press the dry rub ingredients into the beef shoulder on all sides. Sear meat using sauté function for 2 minutes on each side, then remove and set aside. Combine all sauce ingredients in the insert of your instant pot. Place beef into the insert of your Instant Pot and set on high pressure for 50 minutes. Once done, let naturally release. Shred with two forks. 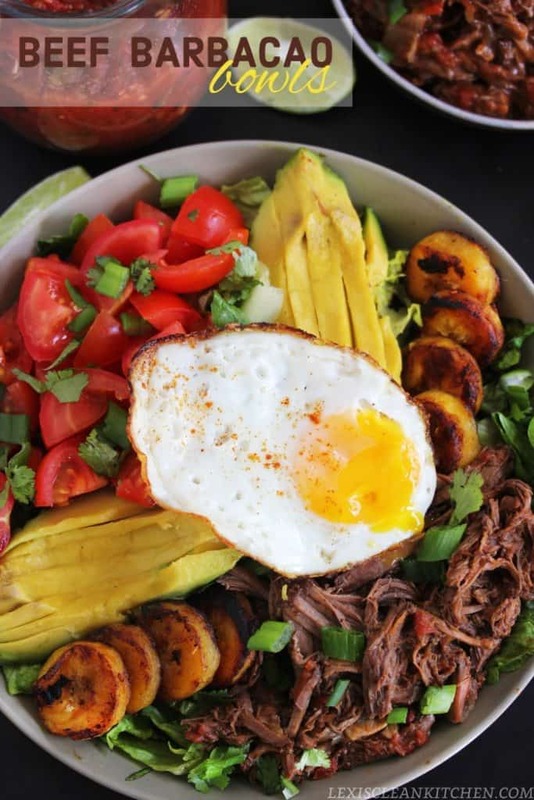 Assemble as a salad or breakfast bowl with desired toppings: fried plantains, tomato, lettuce, onion, scallion, avocado, etc. or serve as tacos! What meat to use for barbacoa? I use a chuck roast or a beef shoulder roast! In a bowl combine rub ingredients. Press rub ingredients into the beef shoulder on all sides. Broil on high for 4 minutes on each side. While in the oven, combine all sauce ingredients in your slow-cooker. Once beef is done in the oven, carefully place it into the slow-cooker and set on low for 7-8 hours. I NEED that breakfast bowl in my life… sooooooo much yum in one place! I love barbacoa! So much flavor in every bite! 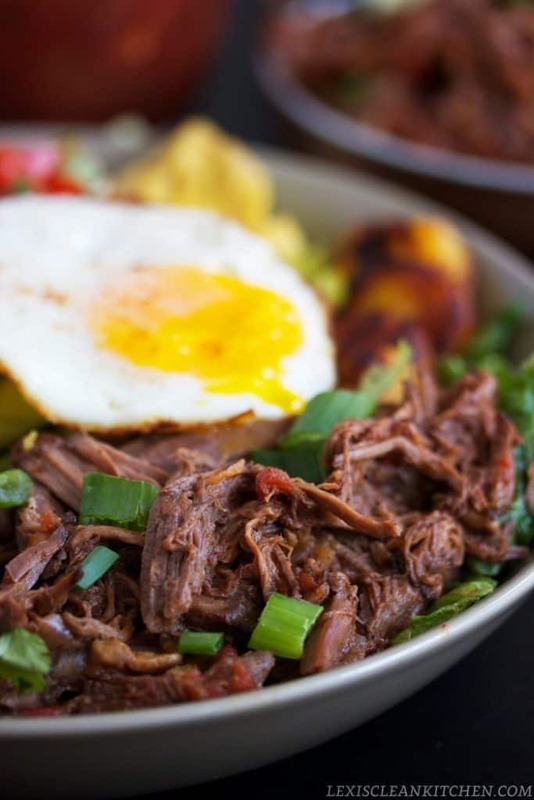 Love the idea of this as a breakfast bowl with that egg on top! Love barbacoa!!! I have some cooking right now for dinner actually 🙂 Love that you put it into breakfast bowls! Lexi, these look even more beautiful than Instagram (and on instagram I was salivating!) Pinned! Looks delicious! Do you have to broil it first? Or could you just put it right in the slow cooker? What do you do with everything left in the crockpot ?? Can it still be eaten!? This looks delicious – so many textures and flavors! Pinned immediately. Looks amazing. Are those bananas or plantains? …. or am I completely off? I bought the ingredients to try this as it look amazing 🙂 I’m in Ireland tho you mention to broil on high, then refer to once it’s done in the oven. So broil means ‘grill’ here, so that’s fine but should the oven be on aswell / instead? Thanks! Is it really 14 oz of green chiles? Only sell in 4 oz containers. Hi! This look awesome! I plan doing it for tomorrow dinner! Would fresh jalapenos replace canned green chiles? Dohi! Do I put the meat over the ingrédients sauce? Put the meat in and add all sauce ingredients as directed in the recipe!